Harmony Lifestyles Group Crowned "Upcoming Developer of the Year"
Despite highly challenging conditions and circumstances for real estate groups, there are few that not only stand out but also continue to grow. As they say when the going gets tough, the tough get going. The Harmony Lifestyles Group headed by Deepak Jain bears testimony to this fact and was recently crowned the " Upcoming Developer of the Year " at a glittering real estate awards nite organised by Accomodation Times. 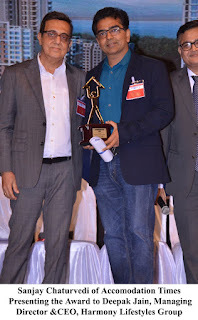 The creme de la creme of the real estate industry were in full attendance at this exclusive attendance and that included keynote speaker Niranjan Hiranandani. Expressing his thoughts on the occasion, a beaming Deepak Jain observed, " We will continue to maintain the highest standards of excellence in our work and strive with greater passion, zeal and enthusiasm. Also present on this occasion was Murari Chaturvedi, Editor in Chief of Accomodation Times. Harmony Lifestyles Group is one of Mumbai's Premier Real Estate Companies, with a rich and trusted legacy of 42 years in the construction of residential, commercial & redevelopment projects. Starting modestly in 1974, the group has since date transformed over one and half million sq.ft into living spaces, housing hundreds of satisfied families and corporates. Currently, it has over 2000000 sq.ft under development in different parts of Mumbai and Thane regions. Harmony Lifestyles Group's value proposition & key philosophy is based on its core values of INTEGRITY, INNOVATION &PROFESSIONALISM. Equipped with an MBA (Marketing) degree and a Strategic Leadership Certificate from Wharton University, USA, Deepak Jain has been the vigour and founder of the corporate banner of Harmony Lifestyles Group since 2005. A well balanced individual excelling in academics and extracurricular activities, Deepak has over 20 years of on ground experience in all aspects of the real estate development industry. He has been single handedly responsible to spearhead the successful development of approximately half a million sq.ft in 5 years during a tough real estate phase in Mumbai and yet managed to maintain a debt free status. No Comment to " Harmony Lifestyles Group Crowned "Upcoming Developer of the Year" "